Some of the country’s best riders saddled up this morning for one of Europe’s leading three-day events. The Bramham Horse Trials, staged at Bramham Park, near Wetherby, were first organised in 1974 and have grown into an important event in the international equestrian calendar. Pocket Farm, Skipton Road, Felliscliffe - �1.1m with Strutt & Parker, 01423 561274. Held over four days, they now attract over 60,000 spectators annually from all over the world. The trials, which finish on Sunday, are well located; our part of the world has long been horse country (the place names of Rossett and Follifoot both have equine origins). Owning horses, though, has never been a cheap affair. Horse-owners have to pay for the animal itself, its tack, feed and forage, dry storage space for hay, farriery, veterinary costs and insurance. You also need a fair bit of land – at least an acre per horse, and ideally two – but not too much, as too few horses on too many acres can become overfed on rich grass and develop laminitis, or inflammation in the hooves. Lollybogs, Back Road, High Birstwith - �1.795m with Strutt & Parker, 01423 561274. You need free-draining land, but with fresh water. Avoid clay soils (boggy in winter, hard in summer), but steer clear of sandy ones too (to avoid colic). You need stables, tack-room and hardstanding – but nothing too fancy, or it might be difficult to sell on. It all adds up, and it’s not unusual for the total annual cost of keeping a single horse to exceed £5,000. Little wonder, then, that properties with equestrian facilities tend to occupy the upper end of the price range. The following three are typical of the genre. Manchester House, near Ripon, is a place where you can really spread out. It occupies high ground at Dallow, near the source of Pye Carr Spring. It has over 4,000 sq ft of living space and 4.5 acres of land, with a further 34 acres available by separate negotiation. The main house has five bedrooms, four bathrooms, dining kitchen, two reception rooms, utility room, study, snug and games room. Outside, there’s plenty of parking, a stable yard with eight stables and central hay barn, plus lawns and a large summerhouse. Lollybogs is a traditional Dales longhouse dating from the 1600s. It has five bedrooms, three reception rooms and beautiful views over lower Nidderdale. Outside, there are gardens and woodland with a beck, natural bogs and a historic drovers’ bridge, plus garaging for 10 cars and further workshops and storage. The property is set within 5.54 acres with level pasture land, a block of three stables with feed/tack, room a field shelter and water troughs which are ideal for equestrian use. 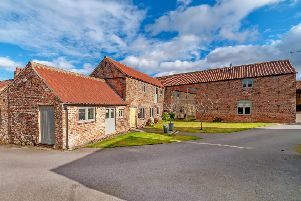 Pocket Farm at Felliscliffe, also in Nidderdale, is a spacious family home set within 5.5 acres of land. It has five bedrooms, one currently used as a cinema room, plus three bathrooms, kitchen, utility room, study, two reception rooms, conservatory and adjoining garage. There are extensive paddocks with three double field shelters, a barn, all-weather manège and stabling for four horses, additional tack room, fuel stores, dairy, outdoor kitchen, plus chicken coup for 80 chickens and even a mini-honesty shop selling free-range eggs.